FORMER ANGLO IRISH Bank CEO David Drumm walked out of a Dublin court smiling this afternoon after he was released on bail pending his fraud trial. The banker, who was extradited from the United States, was freed after he spent five months in custody in American jails and one night at Cloverhill Prison in Dublin. He faces trial over serious financial irregularities at the now defunct Anglo Irish Bank. He blew a kiss to supporters in the public gallery of Dublin District Court when his next hearing date was set. The 49-year-old had been granted bail terms on Monday by the district court but had to spend a night in custody. He appeared again today at the same court to take up bail his own bond of €50,000 along with an independent surety in the sum of €100,000. Solicitor Aoife Corridon, for the defence, told Judge Michael Walsh that Mr Drumm’s mother and father-in-law, Georgina and Daniel O’Farrell, have been approved to stand bail. They have lodged €50,000 while the remaining €50,000 has been frozen in their bank account by court order. They confirmed they were aware of court proceedings involving their son-in-law and that they risked losing the bail money if Mr Drumm breaks the bail terms or fails to turn up for his trial. Two books of evidence were served and Judge Walsh noted that the DPP has directed that the former Anglo boss must be tried on indictment. He was returned for trial to appear at Dublin Circuit Criminal Court on 8 April next. Mr Drumm was asked by Judge Walsh if he would comply with bail terms and replied: “I will”. Judge Walsh also warned him that he must notify the State within 14 days if he intends to rely on an alibi in his defence. At about 1.10 pm, he was freed and emerged smiling from the custody area of the Criminal Courts of Justice building. He walked straight into the arms of relatives and supporters who hugged and kissed him while a media scrum awaited him outside. At 1.30pm, Mr Drumm emerged from the courthouse with his supporters and walked straight into phalanx of news photographers and reporters. He declined to comment before he got into a car and was driven away. The district court has heard he faces a “voluminous” case which could be split into two trials. The prosecution involves allegations of €7bn back-to-back transactions with Irish Life & Permanent, which the State believe was part of a conspiracy to defraud. The charges also allege unlawful loans to the so-called Maple 10 group of investors as well as members of Sean Quinn’s family. His bail terms terms state he cannot leave the country, must sign on twice daily at Balbriggan garda station and not apply for a new passport. In 2009, Mr Drumm, who is originally from the north Co. Dublin suburb Skerries, emigrated to the United States and set up home in Boston; later he unsuccessfully filed for bankruptcy. Meanwhile a warrant was issued for his arrest here in 2014 and an extradition request was then made by Ireland to the US authorities. David Drumm, a father-of-two and a former chartered accountant, was arrested at his home in Wellesley, an upmarket suburb of Boston, on October 10 last year. At first, he refused to consent to his extradition but after two failed attempts to get released on bail, he changed his mind. Ahead of his extradition, he has been held in custody in four different detention centres in two US states. He arrived in Ireland on Monday morning accompanied by fraud squad detectives and was brought to appear at Dublin District Court where the State objected to bail on the grounds he was a flight risk. However, Judge Michael Walsh had held that he was entitled to bail. He said Mr Drumm, who is to reside at Shenick Avenue in Skerries in north Co Dublin, would be unlikely to face trial until 2017 and would be facing a trial involving a “voluminous” amount of evidence involving emails, 400 hours of phone recordings and “millions of documents”. He also said the former Anglo boss was an Irish citizen with strong ties to Ireland. It follows a seven-year probe by detectives from the Garda Bureau of Fraud Investigation attached to the Office of the Director of Corporate Enforcement into alleged financial irregularities at the failed bank which was later nationalised costing taxpayers €30 billion. His wife is putting their Boston home up for sale and she is returning to Ireland in June. Mr Drumm must reside at reside at Shenick Avenue in Skerries in north Co Dublin, sign on twice daily at Balbriggan Garda station and not leave the country. He has surrendered his passport and cannot apply for a new one, while the Department of Foreign Affairs are also to be notified of the court order. Judge Walsh also ordered the former Anglo boss to carry a mobile phone and he added that any calls from gardaí are to be returned in a “timely manner”. The investigation began following a complaint by the Financial Regulator. Comments have been disabled on this piece as legal proceedings are ongoing. Email “David Drumm blows kiss to supporters in court before being released on bail”. 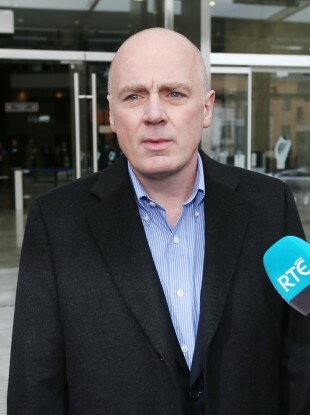 Feedback on “David Drumm blows kiss to supporters in court before being released on bail”.